Hover over the kana to show its romanization and type the answer. 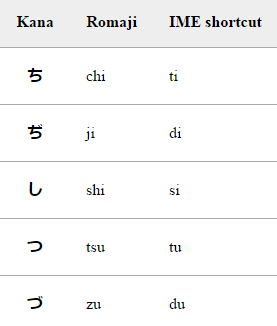 Grind a row of kana until you stop making mistakes, then add another row. Press the Play sound link to make sure you are pronouncing the kana correctly. If you wish to write, the Stroke order link will show you the proper form. You can save a few keystrokes on DJT Kana and your IME with these shortcuts. A few kana add a circle to indicate a "p" transformation. For example, ほ (ho) becomes ぽ (po). The smaller kana ゅ, ょ, and ゃ are used to combine kana sounds. For example, in ぎゃ the consonant of ぎ (gi) combines with the sound from や (ya): gya. The small っ (distinct from つ/tsu) is not itself pronounced, but lengthens the consonant that follows, as in にっぽん (nippon); the effect of holding your mouth in the consonant's position resembles a small pause. Contrast: がこう, がっこう. Tae Kim has more information.